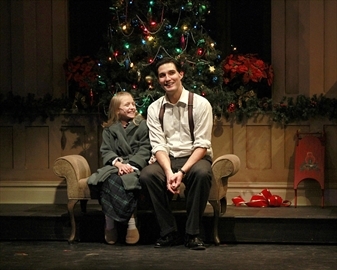 Christmas was welcomed in this week with the opening of Irving Berlin’s White Christmas at St. Jacobs Country Playhouse. The story follows Second World War buddies, Bob Wallace played by Jeff Irving and Phil Davis played by Kyle Blair, a couple of song and dance men who entertained the troops during the war then took their show on the road after discharge. Posted on November 22, 2013, in Arts, Entertainment, Music, Uncategorized and tagged arts, christmas, country playhouse, fun stuff to do, grand river, kitchener, kw, live theatre, plays, st jacobs, waterloo, xmas. Bookmark the permalink. Leave a comment.